Because I don’t have a motorcycle endorsement on my driver’s license, going along for the ride is mostly what I do. I sit on the back of our Victory and delight in the scenery around me. I smell the fresh air, lift my face to the sun and sing. Such was the case a week ago Saturday, when Ralph and I joined riders from Hosanna! Lutheran Church in Lakeville. The occasion was the annual Blessing of the Bikes. (We figure you can never have too much insurance when you’re riding a motorcycle.) This time, both of us were along for the ride, which began at the church in Lakeville. The Lakeville police escorted our group of 75 bikes out of town. It was kind of nice to have them go ahead and change all the traffic lights as we approached. It kept the group together. From Lakeville we rode to Hastings, where we stopped to take a look at Vermillion Falls. We’ve had ample rain in Minnesota this spring, so the falls were cascading in full force. From Hastings, we followed the Ravenna Trail to the outskirts of Red Wing. On the way, we passed the Prairie Island Indian Community, where the Mdewakantan Dakota have built their homes in circles. We passed Treasure Island Casino, then turned right onto U.S. 61 for a short ride to the Welch Road. I was so busy looking at horses grazing in pastures sprinkled with daisies, Holstein cattle that turned their heads to watch us ride by and woods filled with bright purple phlox that I forgot to keep track of the roads we were riding on (that’s true relaxation!). 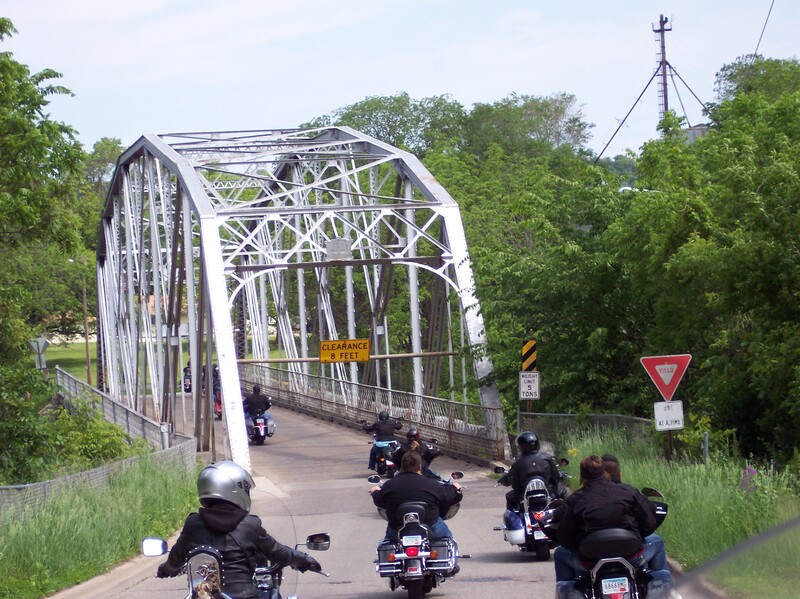 When we came into Cannon Falls, the group headed north out of town. Soon we came to a one-lane bridge that neither Ralph nor I knew existed. It was the highlight of the ride. This weekend, Ralph will join hundreds of riders for the Patriot Ride at Anoka County Airport. I won’t be along for this ride, however. I’m staying behind to sell copies of Ride Minnesota. Posted on June 16, 2015, in Motorcycles, Ride Minnesota, Victory motorcycle and tagged Cannon Falls, Hastings, Hosanna! Lutheran Church, Lakeville, Patriot Ride, Prairie Island Indian Community, Ravenna Trail, Vermillion Falls. Bookmark the permalink. Leave a comment.